Levittown, NY – New Ground Inc. announced today that it raised over $260,000 at its 18th Annual Groundbreakers’ Celebration, making it their most successful fundraiser to date in the history of the agency. 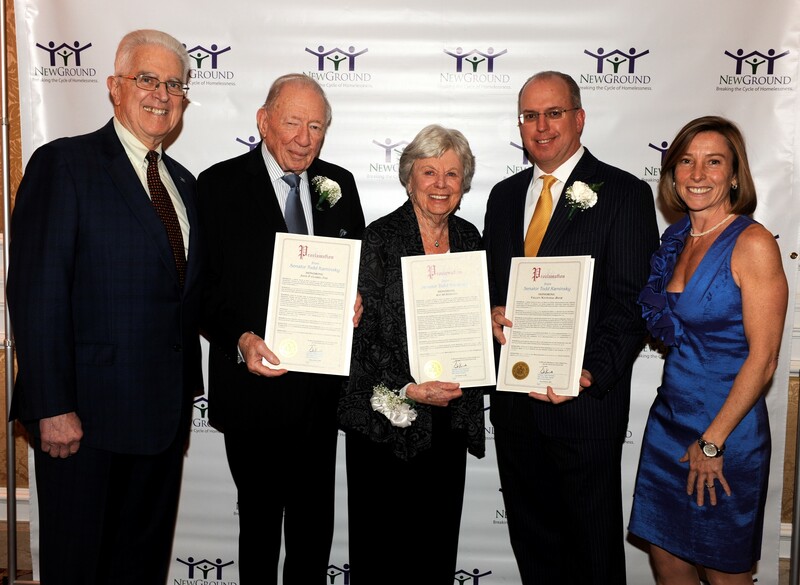 Over 225 friends and supporters gathered at the Garden City Hotel on November 8, 2018 to support New Ground’s critical work assisting struggling Veterans and families on Long Island caught in the vicious cycle of homelessness. It was a special evening filled with good friends, food and entertainment. Guests enjoyed a wonderful performance by the Roosevelt High School Choir in recognition of New Ground’s families and a Color Guard presentation by the 1st Marine Corps. District in honor of the agency’s Veterans Program. This year’s event honored Valley Bank and Joseph Burns, Senior VP at the Bank with the Groundbreakers’ Award for their ongoing commitment to see New Ground’s Veterans and families succeed. Also recognized this year were Kay McKiernan with the Máiréad M. Barrett Founder’s Award and John P. Clarke, Esq. with the Thomas Whalen Memorial Award. Both Kay and John have been longtime volunteers and supporters of New Ground Veterans and families, ensuring all will continue to reach their goals and achieve future independence and self-sufficiency. The event was Co-Chaired by Matt & Marguerita DeLuca, New Ground Advisory Board members and Lloyd Neck Harbor residents as well as New Ground Board member, Chris Salute, a resident of Bayville and Professor at LIU Post. The evening would not have been possible without the generosity of all those involved including the event’s top sponsors: Thomas & Eileen Lamberti, Chris & Sheryl Albanese, John P. Clarke, Esq., Matt & Marguerita DeLuca and Ed & Sheila McDougal. This entry was posted in Uncategorized on December 6, 2018 by DianeSerenita.